Please do come out for store hours and you can still meet everyone, but we are disappointed to need to cancel this year. Experience the first Christmas: The journey, sights, sounds, and feel. 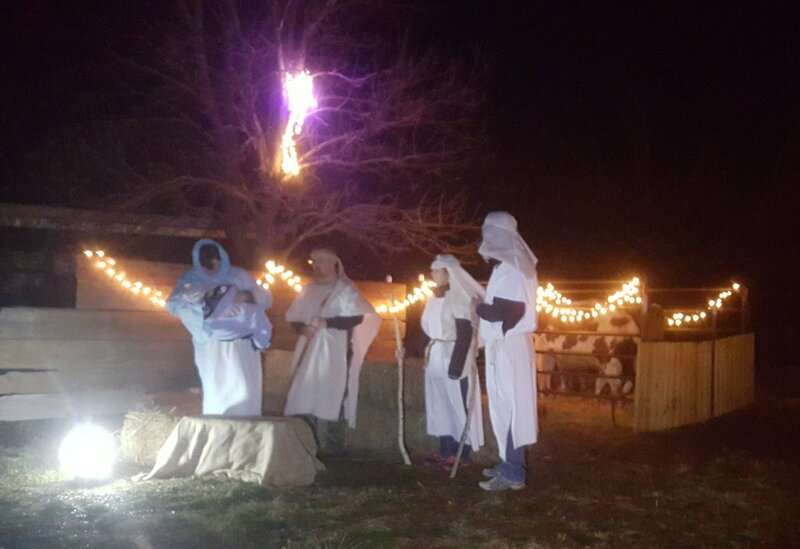 Live nativity, meet the animals, caroling, bonfire, cookies and cocoa. Free to attend! Donations are being accepted to support the Raymond Central Backpack Program kids. The Journey: We are located right at the corner of Country Road 15 & A (Google Maps makes it look further north). It is 3 miles east of Ceresco or 12 miles West of Ashland on paved CR A. Parking entrance is our driveway along CR 15, please don’t park on the pavement (CR A). The Sights: We will have two performances of the nativity at 5:30 and 6:30. The rest of time the nativity will be open so everyone can meet the people and animals! We will have the cows, chickens, horses, and neighbors will be adding in their sheep, goats, and a donkey. Living in the country, we don’t have streetlights, so plan to bring a flashlight or even better a camping lantern (no oil lamps please) to see safely from your vehicle and join in our celebration of light! The Flavor: Our seasonal ice creams, hot cocoa, and coffee floats will be available. Decorate your own Christmas cookies! Bring your own mug and help us be zero waste. The Sounds: We will be caroling during the performance, you can bookmark the lyrics so you have them handy. The Feel: We do live in Nebraska, so we are keeping a close eye on the weather! Everything is outdoors, it is wind protected, but dress to enjoy the outdoors. We’ll have a bonfire and plenty of hot cocoa! The People: We have a wonderful group of volunteers helping make this event happen! Want to help? Send us a message!